While British Columbia has been experiencing enhanced social and economic well-being, it has also experienced avoidable cumulative environmental impacts, due to pressures on land and water resources. 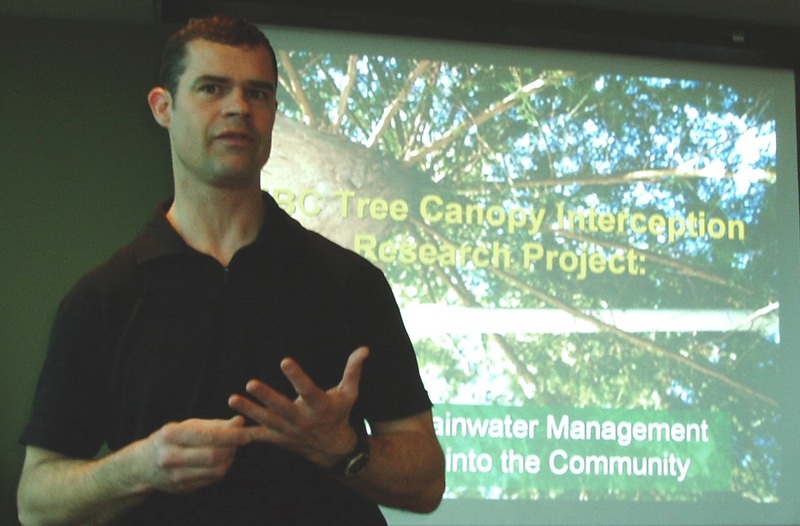 The desire to mitigate environmental impacts has provided a driver for the ‘green infrastructure’ movement in British Columbia. This movement is water-centric, is founded on a natural systems approach, and is influencing infrastructure policies, practices and standards. 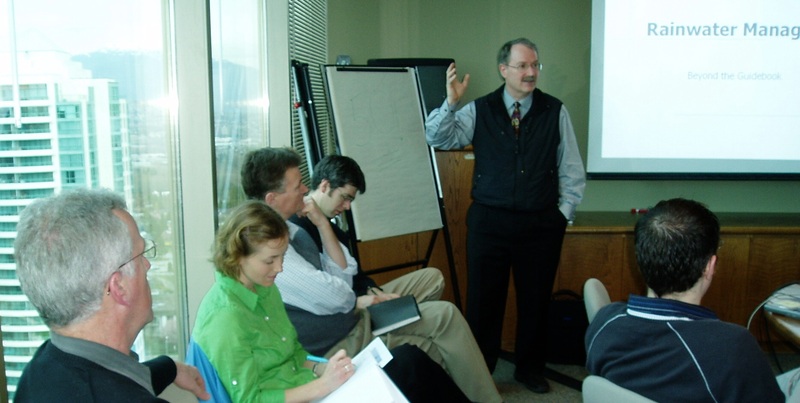 When Stormwater Planning: A Guidebook for British Columbia was published in 2002, it set in motion a chain of outcomes that has resulted in British Columbia being recognized internationally as a leader in implementing a natural systems approach to rainwater management in the urban environment. One of these outcomes was the Water Balance Model for British Columbia, an online decision support and scenario modelling tool. 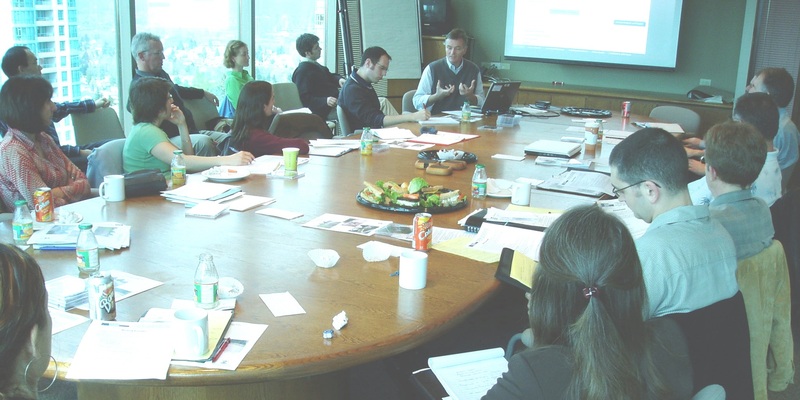 The Inter-Governmental Partnership held a Water Balance Model Partners Forum in March 2007 so that Partners could share success stories and lessons learned in implementing green infrastructure. 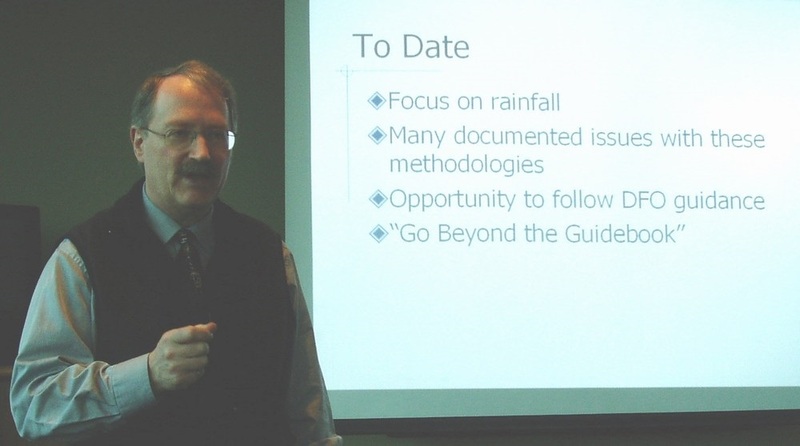 Hosted by the Greater Vancouver Regional District, the Partners Forum also provided a timely opportunity to roll out ‘Beyond the Guidebook’, a runoff-based approach to drainage modeling that connects the dots between source control evaluation and stream health assessment. Special guests at the Partners Forum included Liliana Bozic (City of Calgary), Chair of the Alberta Low Impact Development Partnership (ALIDP); Dr. Charles Rowney, the designated Scientific Authority for the Water Balance Model; and Linda Pechacek (from Houston, Texas), representing the Urban Water Resources Research Council. “To sustain the early success of the Water Balance Model, and to advance ‘sustainable drainage’ initiatives across Canada, the Ministry of Agriculture & Lands provided the IGP with $160,000 to expand the capabilities of the Water Balance Model by integrating it with QUALHYMO, a rainfall-runoff model developed by Dr. Charles Rowney in the early 1980s. This means engineers will be able to model the storage and routing of outflows from a subdivision and/or neighbourhood through a detention pond or down a stream channel”, added Ted van der Gulik. “We now see a comparable relationship-building process taking shape on Vancouver Island with the formation of the inter-agency Water Balance Coordinating Team co-chaired by Jay Bradley, Ministry of Agriculture & Lands, and Chris Jensen, Ministry of Community Services. Looking ahead, the IGP anticipates that this may be the template for other regional initiatives”, observes Laura Maclean. One of the benefits of the Water Balance Model Partnership is networking. 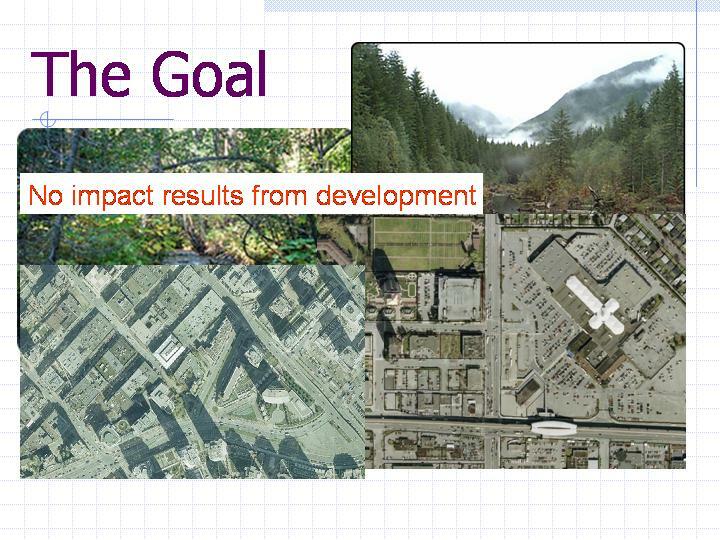 The City of Courtenay and City of Surrey have been sharing their lessons learned. David Hislop highlighted the City of Surrey experience in soil depth enforcement in the East Clayton Sustainable Community. David Hislop has prepared a visual complete with sound effects to illustrate the magic of dirt. 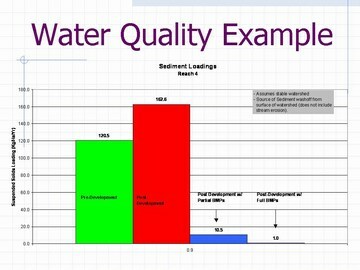 For more information on the East Clayton Sustainable Community, including the results of a performance monitoring program for rainfall infiltration, please click here to view a presentation that was made in December 2006 as part of the GVRD Sustainability Community Breakfast Series. 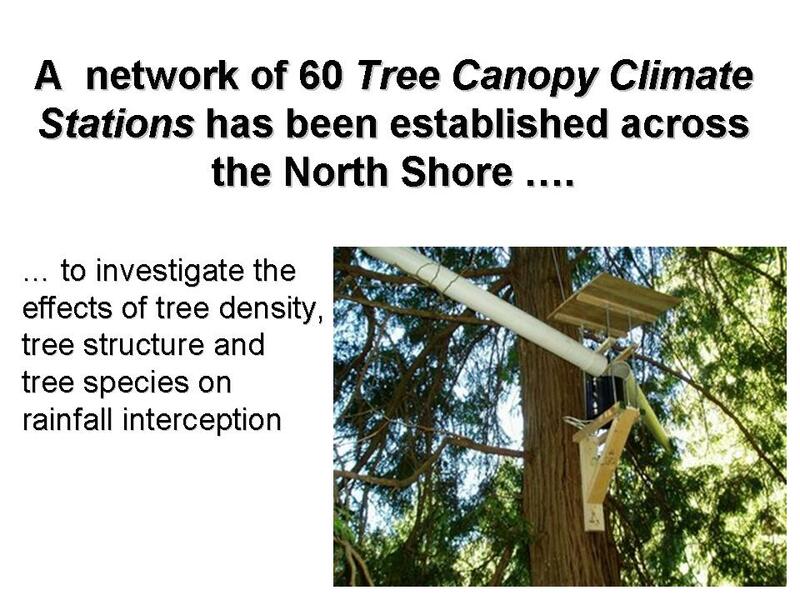 Also, please click on Showcasing Innovation in Surrey for a related story on an event which was hosted by the City in June 2006 in collaboration with the Green Infrastructure Partnership. 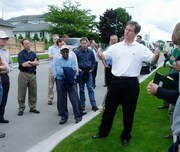 This involved a guided tour for Greater Vancouver municipalities, with colour commentary provided by David Hislop. 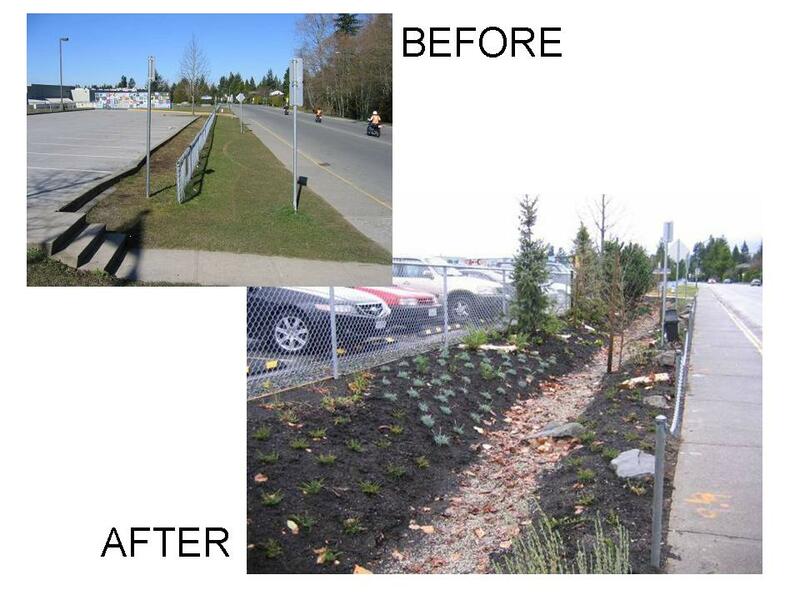 Sarah Howie showed examples of rain gardens and infiltration swales to illustrate how the Municipality of Delta is implementing landscape-based solutions that solve drainage issues and create community amenities. 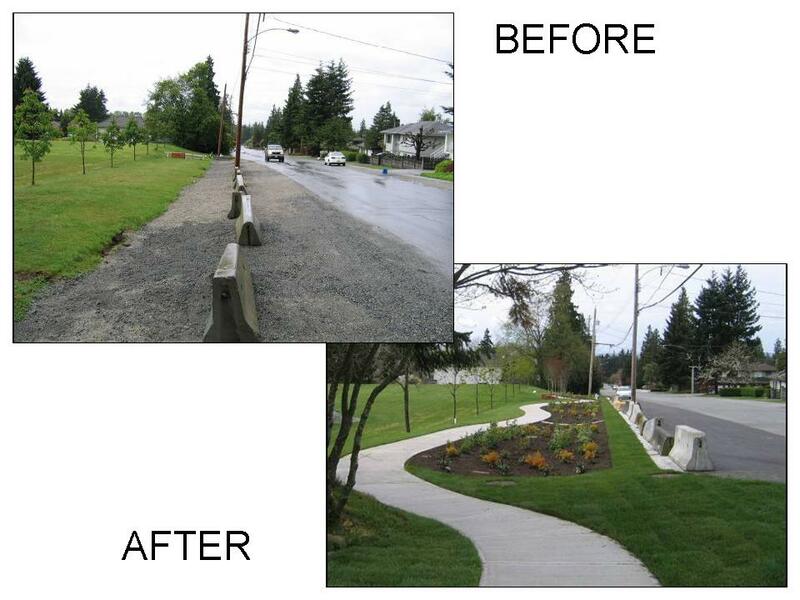 The before and after photos below illustrate the filling of a roadside ditch with an Atlantis Rain Tank system and the completed project on 86th Avenue in Delta. Another Water Balance Model Partner that is investing a major effort in landscape-based solutions is the City of Kelowna. For information on what the City is doing, please click on this link to Kelowna’s Water Conservation Experience The focus of the presentation by the City’s Don Degen at the Building SustainAble Communities Conference was on what level of water saving can be achieved through landscaped-based measures such as soil amendments and irrigation system improvements. The other benefit of soil depth plus amendment is reduced rainwater runoff. The experience of the City of Vancouver demonstrates that someone has to ‘build the first one’ so that others will follow. Crown Street and Country Lanes have established regional precedents that other municipalities are now replicating. 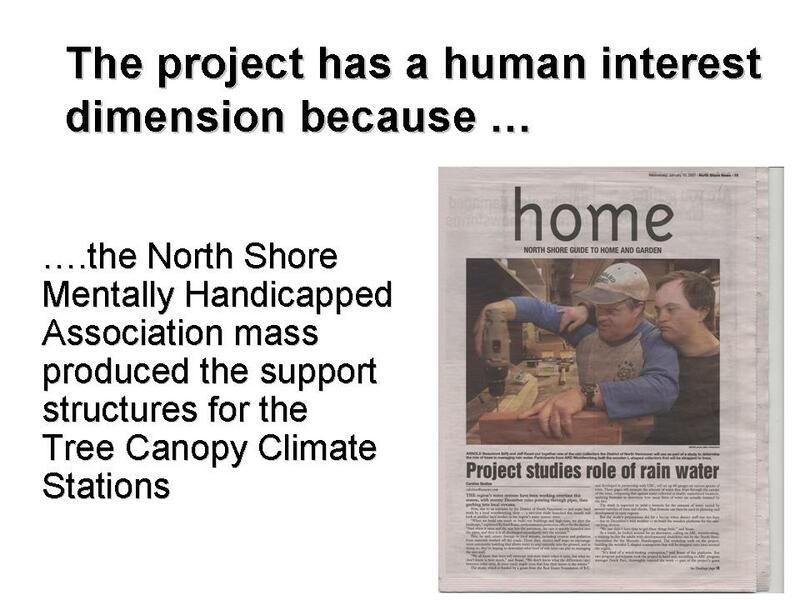 Both were featured in the Showcasing Innovation Series organized by the Green Infrastructure Partnership in 2006. For the complete story, please click on this link to Showcasing Innovation in the City of Vancouver. “The first year of performance monitoring for Crown Street has been completed and the results will be released shortly. I can confirm that the infiltration system is performing as expected”, Andrew Ling reported at the Partners Forum. The East Fraser Lands project for a community of 10,000 along the north bank of the Fraser River within the City of Vancouver is a case study for “Beyond the Guidebook”. The project is applying a design with nature approach that advances the state-of-the-practice in rainwater management by doing something on each roadway to achieve a rainwater management outcome. Innovative rainwater management systems will turn rainwater into a resource and enhance the quality of rainwater before it is released to the Fraser River ecosystem. 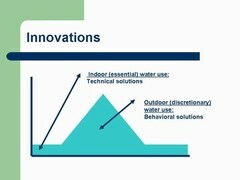 The project also involves an innovative application of the Water Balance Model to support technical decision-making. 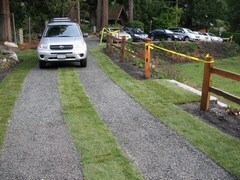 “The City of Vancouver’s Country Lanes provided the inspiration for West Vancouver’s first green lane adjacent to St. Francis in the Woods Church in historic Lower Caulfeild”, noted Saleem Mahmood of the District of West Vancouver. 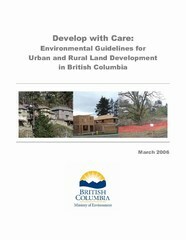 The March 2006 version of Develop with Care replaces the previous versions (June 2004 and April 2005) of Environmental Best Management Practices for Urban and Rural Land Development in British Columbia. “Develop with Care includes many ideas and suggestions on ways to achieve ‘cleaner, greener’ developments and provides information on ways that environmental protection and stewardship can benefit the community, the property owner, and the developer, as well as the natural environment. 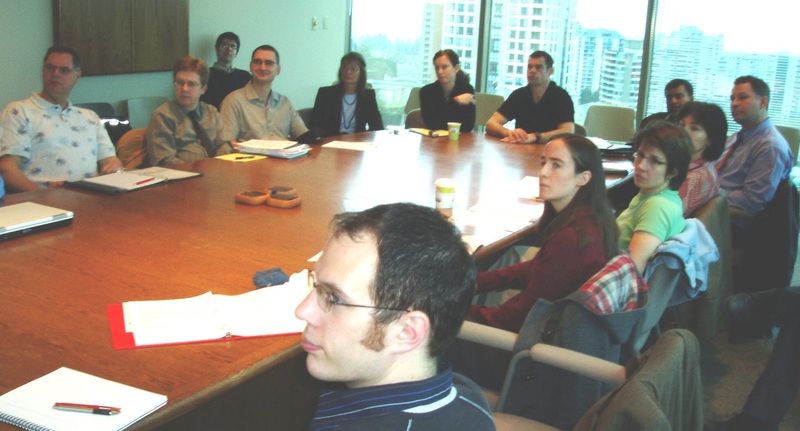 Decisions related to urban and rural land development in this province are shared by many; therefore, this document is intended to support and encourage good decision making by all those involved in land development in British Columbia. Develop with Care emphasizes the use of the Water Balance Model to achieve desired rainwater management outcomes”, concluded Peter Law. 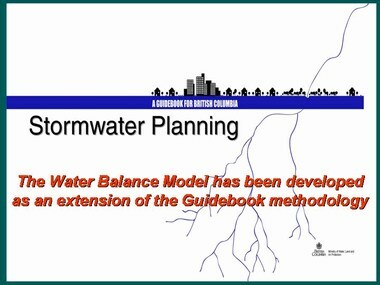 When Stormwater Planning: A Guidebook for British Columbia was published in 2002, it established the framework for rainfall capture and a performance target way-of-thinking and designing. “The concepts and methodologies in the Guidebook were intended to stimulate a change in the mindset of practitioners and others, rather than cast in stone a set of prescriptive rules”, reported Peter Law, Chair of the inter-governmental Steering Committee that was responsible for Guidebook development. “Five years later, a goal of the Inter-Government Partnership is to build on the Guidebook foundation by providing practitioners with the tools and experience they will need to advance the state-of-the-practice in rainwater management”, continued Laura Maclean, who co-chaired the Guidebook Steering Committee. 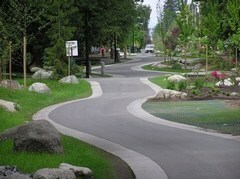 “The pilot for Beyond the Guidebook is the Fergus Creek watershed plan that the City of Surrey has recently completed. The Fergus Creek plan demonstrates how to protect stream health in the urban environment”, noted David Hislop, City of Surrey representative on the Water Balance Model steering committee. In commenting on the significance of the Fergus Creek plan as the pilot for Beyond the Guidebook, Kim Stephens observed that the plan is based entirely on implementing ‘green solutions’ as an alternative to conventional engineered ‘blue solutions’, and predicted that Fergus Creek will soon be attracting considerable attention from around North America because of the City’s fundamental shift in approach to rainwater management. 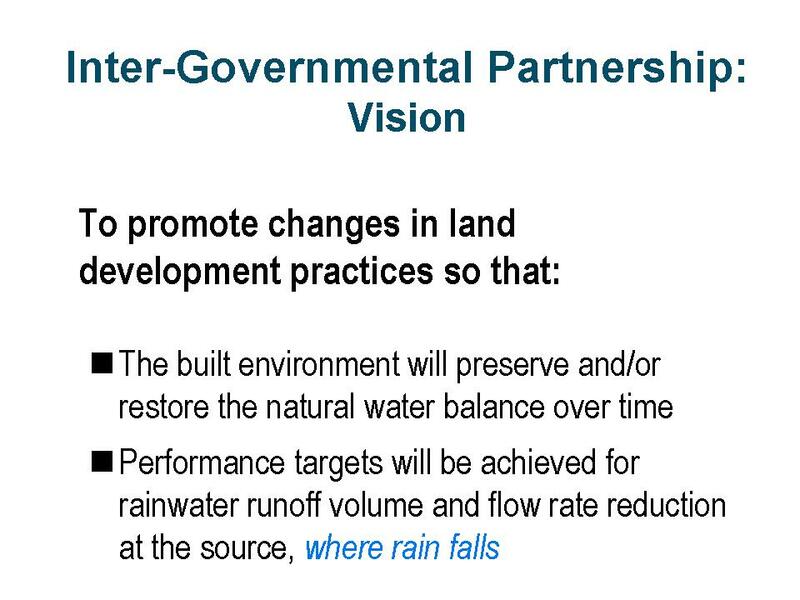 “That’s right”, continued David Hislop, “In addition to rainwater capture on individual lots, the strategy for replicating natural infiltration processes includes creation of contiguous large-scale green corridors through the watershed. Besides obvious environmental benefits the City has concluded that the corridors can result in cost savings for developers (and ultimately homebuyers) and the City because their effectiveness at controlling rainfall volumes makes the traditional detention pond redundant.” To learn more about the Fergus Creek plan, please click here. Kim Stephens also informed the Partners Forum that: “The Department of Fisheries and Oceans (DFO) is a partner in the Beyond the Guidebook process, in part because this runoff-based approach is intended to resolve performance concerns that we believe have arisen due to misapplication of the so-called DFO Guidelines.” His reference was to a 4-page document originally released by DFO in 2000 and titled Urban Stormwater Guidelines and Best Management Practices for Protection of Fish and Fish Habitat. 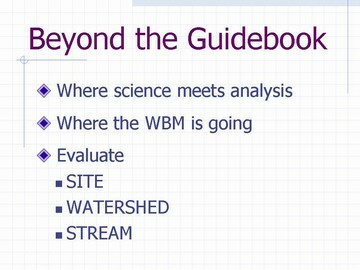 This frame-of-reference provided the segue for a detailed presentation by Jim Dumont on the Beyond the Guidebook methodology. 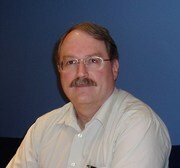 Jim Dumont is the senior water resources specialist who is responsible for development of the stream health application that is at the heart of the Water Balance Model powered by QUALHYMO. “The rainwater management issue in a nutshell is that people want to have their cake and eat it too…because they want development, yet they want to avoid the types of in-stream environmental impacts that have historically resulted from changing the surrounding landscape through urbanization. So how do we reconcile this challenge”, stated Jim Dumont. 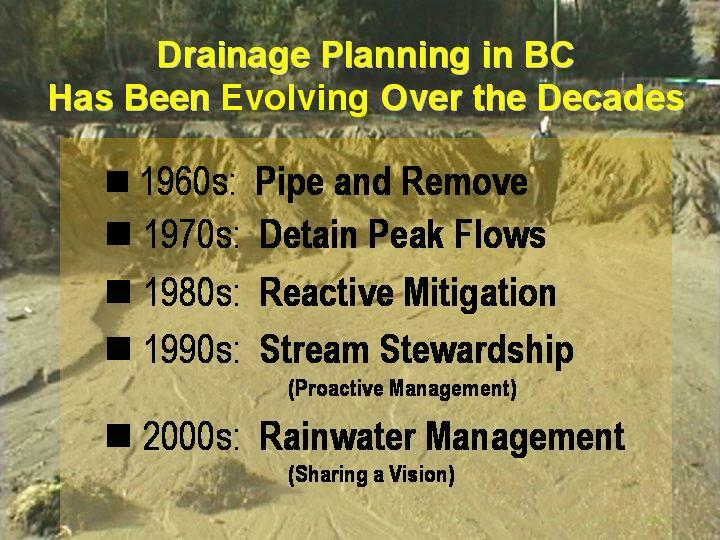 “Well, we start by examining the criteria that have driven stormwater and rainwater management practice in British Columbia for the past 15 years. The current era as we know it began with the 1992 Land Guidebook Guidelines. To understand where we are going, you have to first understand where we have come from”, he continued. 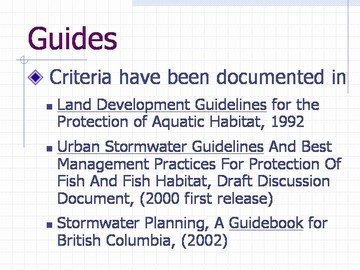 Application of DFO Guidelines: The so-called ‘DFO Guidelines’ were developed on a parallel track to the Guidebook, and reflected inter-agency discussions that were taking place at the time. 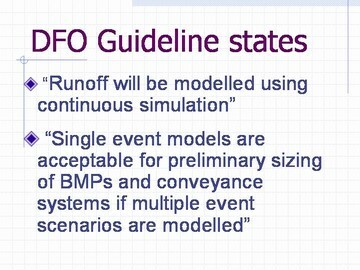 This 4-page ‘Draft Discussion Document’ represented an initial attempt by DFO to succinctly capture contemporary thinking about criteria that would achieve runoff reduction through infiltration of the more frequent runoff events. 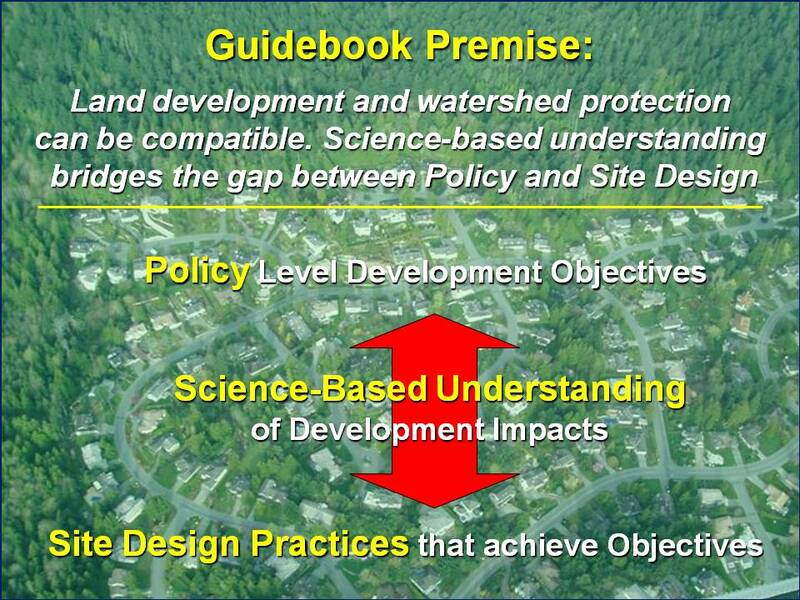 The Water Balance Methodology that is at the heart of the Guidebook drew heavily on case study experience by those who pioneered implementation of source controls on-the-ground in British Columbia, notably the City of Chilliwack and UniverCity on Burnaby Mountain. The DFO Guidelines informed this case study experience. 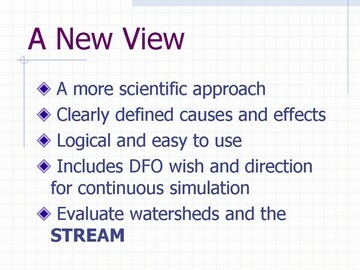 A New View: “When we use the phrase Beyond the Guidebook, we are essentially saying this is ‘where science meets analysis’… because the science-based analytical methodology that we have validated through the Fergus Creek pilot now enables local governments to explore the fundamental requirements implicit in the DFO Guidelines for stream health and environmental protection. We are at a crossroad in the path defining the methodologies and applications used in rainwater management. 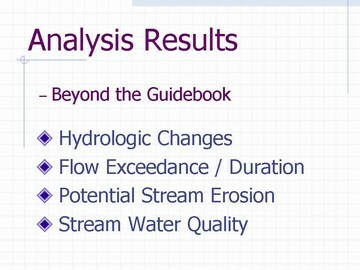 In a nutshell, Beyond the Guidebook enables us to make a clear distinction between a rainfall-based approach and a runoff-based approach”, continued Jim Dumont. According to Jim Dumont, “A basic tenet of hydrology is that rainfall and runoff have different return periods. Yet drainage practitioners persist in applying a rainfall-based approach that assumes rainfall will always result in the same magnitude of runoff.” The Rainfall-Based Approach grew out of simple to use methodologies that address the reduction of flood risk for drainage conveyance systems. 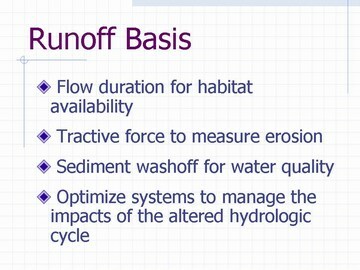 The Runoff-Based Approach, on the other hand, leads to the analysis of runoff and its interaction with the physical aspects considered important to the aquatic environment. 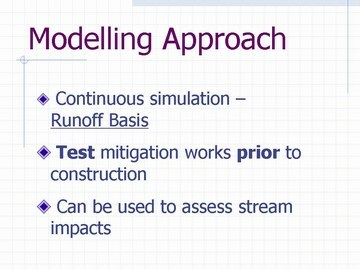 Modelling Approach: A primary benefit of the Runoff-Based Approach is the use of continuous simulation using long-term records to calculate runoff means that the frequencies and durations of various conditions can be estimated easily. 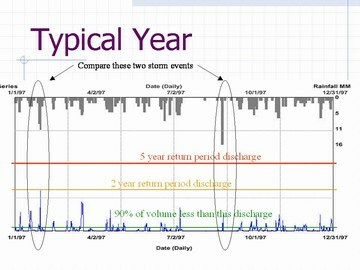 The performance of rainfall capture and runoff control facilities for volume and flow rate reduction depends not only on the rainfall volume and temporal distribution, but also on antecedent conditions such as soil moisture and the volumes of existing water retained in ponds from previous storms. 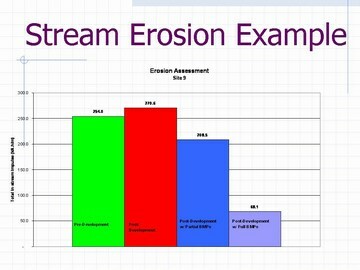 All of these factors overlie the physical characteristics of a site or watershed in terms of vegetative cover, imperviousness, connectivity, slope, and the many defining parameters describing the condition of the soils. The use of continuous simulation allows a direct observation of the frequency of the condition of interest from the results of the calibrated models, and therefore accounts for the effect of joint probabilities of occurrence of the large number of variables. The hydrograph for a ‘typical year’ underscores the variable response of a watershed to rainfall. Two events are highlighted. The larger of the two rainfall events resulted in much less runoff. As can be seen from the hydrograph, the small of the two rainfall events was preceded by a period of wet weather such that more runoff resulted. The hydrograph also shows that 90 percent of the total annual runoff volume corresponds to a very small runoff rate. Water Balance Model powered by QUALHYMO: The principal focus of the existing Water Balance Model is on source controls for runoff volume reduction. For drainage engineers, however, a practical modelling tool must also concentrate on the overflows from the site. 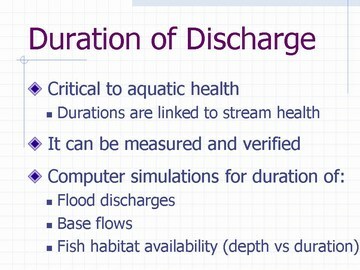 This is the significance of having the capability to store and route the overflow from a subdivision and/or neighbourhood through a detention pond or down a stream channel. The Water Balance Model powered by QUALHYMO will enable assessment of source control performance plus model the overflows once source controls have reached capacity. “This integrated tool provides the ‘one-stop shopping’ that will enable hydrological engineers to go Beyond the Guidebook in achieving stream health protection and water quality objectives”, stated Jim Dumont. 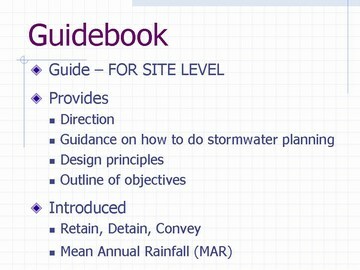 The Guidebook pioneered the application of performance targets to rainwater management, and the Water Balance Model enables users to test their achievability. For a performance target to be implemented and effective, it must be quantifiable. It must also have a feedback loop so that adjustments and course corrections can be made over time. To be understood and effective, a performance target needs to synthesize complexity into a single number that is simple to understand and achieve, yet is comprehensive in scope. 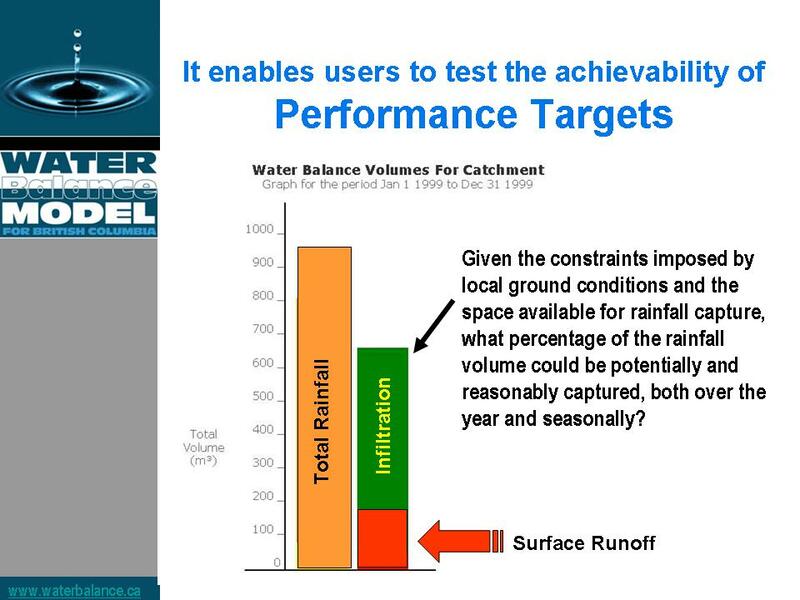 A runoff volume-based performance target fulfills these criteria. 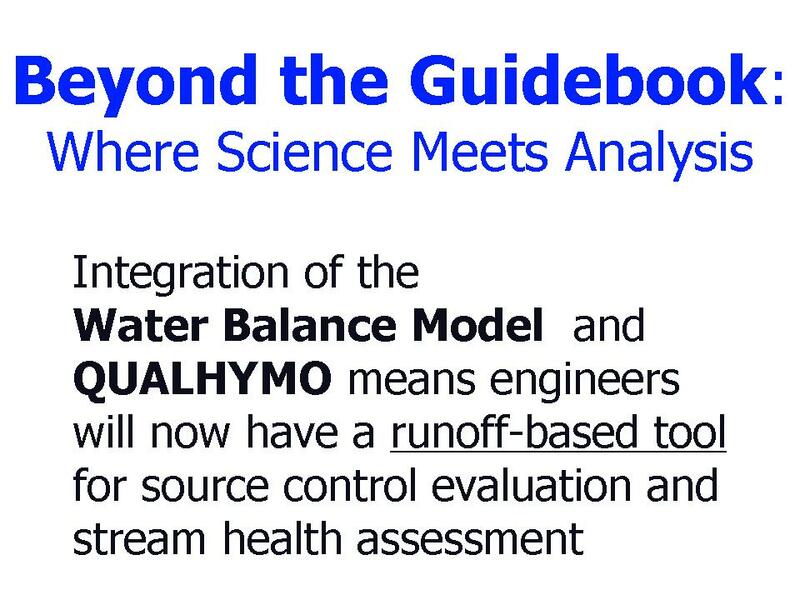 The output from the current version of the Water Balance Model is ‘surface runoff’, whereas the output from the Water Balance Model powered by QUALHYMO will be ‘total flow’. This expanded capability is a key to determining what level of rainfall capture may be effective and affordable. “It is important for everyone to keep in mind that the application of a performance target approach is essentially about due diligence and doing the right things to capture rain where it falls. The performance target approach is intended to be the exact opposite of a prescriptive approach. The latter is counter-productive when it leads to rigid standards that have the effect of inhibiting creativity and innovation”, added Peter Law. 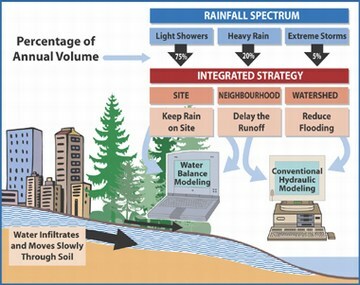 In 2002, the purpose in introducing performance targets for rainfall capture was to facilitate implementation of the Integrated Strategy for managing the complete rainfall spectrum. To create a mind-map for practitioners, the rainfall spectrum was defined in terms of three tiers, with each tier corresponding to a component of the integrated strategy, namely: light showers, heavy rain, and extreme storms. Defining rainfall tiers enabled a systematic approach to data processing and identification of rainfall patterns, distributions and frequencies. Establishing the Mean Annual Rainfall (MAR) as a reference point provided a convenient way to divide the total number of rainfall-days per year into three groupings. The relevance of the MAR is simply that it established a starting point for assessing the achievability of rainfall capture. In 2002, focussing on the MAR facilitated a paradigm-shift in the state-of-the-practice because it demonstrated that rainfall capture was achievable: the number of rainfall-days up to and including the MAR equated to 90% of the total annual rainfall volume. “Normal sediment loading from a stable urban watershed is in the range of 0.10 to 0.61 tonnes per year per hectare of watershed. 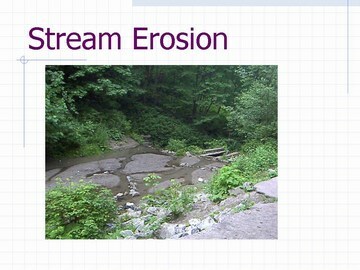 It is therefore normal and expected that a stream will carry some sediment on a regular basis. Because sediment transport is a natural process, it should not be disrupted without anticipating some consequences. So, when simulating the build-up and wash-off of sediment and first-order decay contaminants from a watershed, the general objective is to identify what combination of rainfall capture measures will maintain a natural level of annual suspended sediment loading”, explained Jim Dumont.